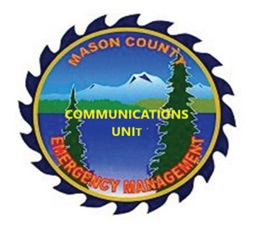 The Mason County Communications Unit (CommU) was established by the Mason County Department of Emergency Management in June 2018. It is organized and operates as the “Auxiliary Communications Unit” for the Incident Commander under the county Emergency Management Plan. The mission of the CommU is to establish and maintain the leadership and organizational infrastructure necessary to provide various radio communications in support of emergency management entities and public service agencies throughout Mason County.. In Mason County, CommU members are combined with the MC-ARES/RACES unit. The CommU will act as a RACES unit if activated and work under the supervision of the MC-DEM Manager. For more information, please contact Tom Dennis, MC-DEM CommU Unit Leader at: KA4VVA@gmail.com.